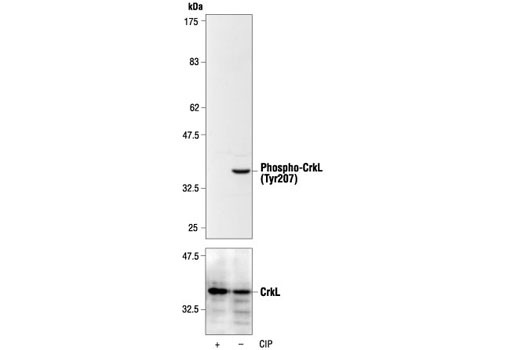 Western blot analysis of extracts from K562 cells, untreated or calf intestinal phosphatase (CIP)-treated, using Phospho-CrkL (Tyr207) Antibody (upper) or CrkL Antibody #3182 (lower). 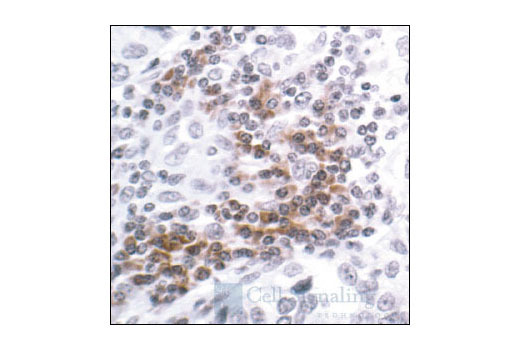 Immunohistochemical analysis of paraffin-embedded human lung adenocarcinoma, showing membrane and cytoplasmic localization, using Phospho-CrkL (Tyr207) Antibody. 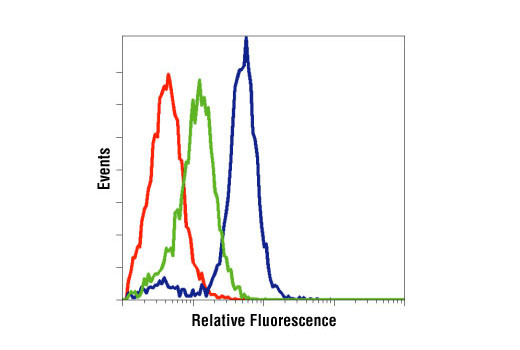 Flow cytometric analysis of K562 cells, untreated (blue) or STI571 treated (green), using Phospho-CrkL (Tyr207) Antibody compared to a nonspecific negative control antibody (red). Phospho-CrkL (Tyr207) Antibody detects endogenous levels of CrkL only when phosphorylated at tyrosine 207. The antibody cross-reacts with CrkII phosphorylated at tyrosine 221. CrkL, a 39 kDa adaptor protein, has a key regulatory role in hematopoietic cells. CrkL has one SH2 and two SH3 domains, with 60% homology to CrkII (1). The amino-terminal SH3 domain of CrkL binds proteins such as C3G, SOS, PI3K, c-Abl and BCR/Abl. The SH2 domain of CrkL can bind to tyrosine-phosphorylated proteins such as Cbl, HEF1, CAS and paxillin (2,3). CrkL is involved in various signaling cascades initiated by different cytokines and growth factors. The biological outcomes of the Crk-activated signal transduction include the modulation of cell adhesion, cell migration and immune cell responses (4). CrkL is a prominent substrate of the BCR/Abl oncoprotein in chronic myelogenous leukemia and binds to both BCR/Abl and c-Abl (5). CrkL is prominently and constitutively tyrosine phosphorylated in CML neutrophils and is not phosphorylated in normal neutrophils. Moreover, stimulation of normal neutrophils with cytokines and agonists does not induce tyrosine phosphorylation of this protein (6), indicating that it may be a useful target for therapeutic intervention or as a disease marker. Tyr207 in CrkL is the BCR/Abl phosphorylation site (7). Satter, M. and Salgia, R. (1998) Leukemia 12, 637-644. Feller, S. M. et al. (1998) J. Cell. Physiol. 177, 535-552. Feller, S. M. et al. (2001) Oncogene 20, 6348-6371. Grumbach, I. M. et al. (2001) Br. J. Haematol. 112, 327-336. Nicholas, G. L. et al. (1994) Blood 84, 2912-2918.
de Jong, R. et al. (1997) Oncogene 14, 507-513.